“A teacher is by far more than an educator. A teacher is one who plays many roles – the roles of a friend, counsellor and mentor. A teacher can be the guiding force in lives even after one passes through the portals of school and step into a world where there is much to be experienced, encountered and conquered,” said Dr Elizabeth Lee, Senior Executive Director of Sunway Education Group and Sunway University in addressing the teachers at the recent Teachers’ Day Celebration in Sunway University. Evening Cloud Acoustic dedicating a song to the guests. “Today, we recognise the great sacrifices that you, dear teachers have made for our young people. We commemorate those who have taken up the task of educating our nation’s children, guiding them through life not only while under your care but for some for many years after,” she continued. 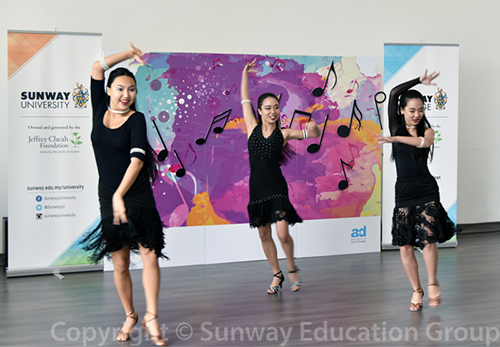 The event, themed the “Sunway Musical Festival”, was to honour and celebrate members of teaching profession, for their tireless contribution and dedication to the education industry and shaping the future leaders for the nation and the world. Latin dance performance from Sunway Dance Club. The event kicked-off at 1.30pm with a solo performance of “Can’t Help Falling in Love” from Khairul Aiman Kamal, a Victoria University (VU) student in Sunway College. 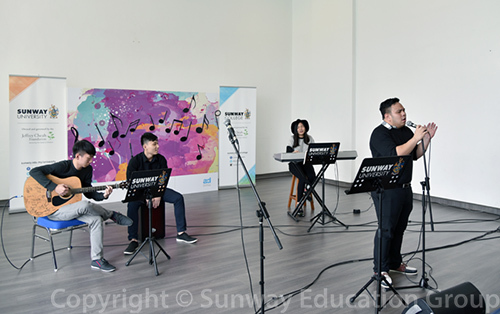 The teachers were entertained with music performances from an acoustic band comprised of students in Sunway University and Sunway College – Evening Cloud Acoustic; a sajak citing with piano accompaniment by Aida Najihaa Ahmad Ridzuan and Jasmine Ng, students from Foundation in Arts (FIA), Sunway College and Latin dances by the Sunway Dance Club. 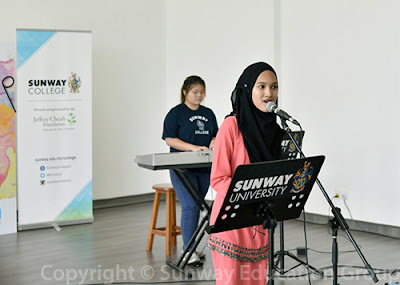 Aida citing her sajak titled “Guru O Guru” by Usman Awang, with piano accompaniment by Jasmine Ng. Guests were also encouraged to pose for photographs at a specially designed backdrop complete with props. A few took up the challenge and participated in a guess the song game. More than 20 lucky teachers went home with special passes for an upcoming ceramic workshop worth RM200.